If you have an iPhone, iPod Touch, or Android phone, you can now easily score your rounds, view statistics and share your golf glory with friends using Golfshot. This player’s app has made golf into a more interactive game with GPS-based information (aerial maps of the course, instant distance-gauging, and more) and score and statistics sharing. The app allows you to keep score for your game, analyze statistics for any player you’ve scored (or shared with) so you can calculate handicaps or just compare players, but the coolest feature is the maps. The GPS-based mapping system will bring up the course you’re on and allow you to select a hole and then calculate distances, see par shot patterns, and more. Once you’ve stroked, you can mark the tee, move to your ball and mark that and see not only the distance of your hit, but also the distance to the green and the angle of approach for best results. No more laser range finding either, since this app does the ranges for you. You can also keep track of your scoring and even your individual strokes with each club and hit distance saved, so you can see which wood or chipper is working best for you in a given situation or field. You can also see overall statistics for your game at a specific course, hole, or for your whole game all together. 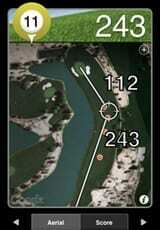 This is a slick, useful app for the avid golf player. This kind of in-depth score and record keeping can really improve your game and the elimination of the range finder only adds to its appeal.